New parents keep asking when to stop swaddling their babies for some reasons. Although swaddling is a nice way to comfort and soothe your baby, the problem is that you may not like the situation when your baby becomes too dependent on swaddling to go to sleep. You may also do not want to get up every 20 minutes at night to re-do the swaddle. Most newborns continue to have a startle reflex, and it stays until 4-5 months of age. You should not stop swaddling if the startle reflex is still strong, or else your baby will keep startling himself or herself awake at night. Do not stop swaddling just because your baby tries to break free of his or her swaddle. Firstly, you can switch to a safer swaddling blanket to see if the change works. If your baby still tries to break free of his or her swaddle frequently, you may consider stopping swaddling. Do not let swaddled baby sleep with her face down, so you may have to stop swaddling if your baby manages to roll over on to his or her tummy during sleep. Safety should always be your first priority when it comes to swaddling. If you want to train your baby to sleep, you may start reducing the duration of swaddling. Stopping swaddling will help your baby learn how to self-soothe. Now you get the idea of when to stop swaddling babies, you also need to learn how to do it. You cannot just stop swaddling your baby all of a sudden. Here are a few techniques that will help you. 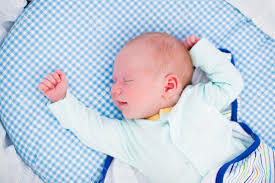 If you start gradually, your baby will be more likely to accept unswaddled sleeping without an issue. At the beginning, you should only swaddle your baby's arms and hands but leave the legs unwrap. It is possible to find special swaddling products to achieve this task or you can always improvise with cloth diapers, blankets, etc. Alternatively, you can also try starting with the hands. You should go through each stage of unswaddling gradually. Proceed to the next stage only after your baby accepts the previous stage. Keep moving forward until your baby can sleep without swaddling. You should stop moving forward if you notice issues such as too much struggle to sleep and frequent sleep-wake cycles. These signs usually mean your baby has not accepted the first stage yet. Proceed when he or she becomes comfortable with the previous stage. If your baby loves swaddling a lot, consider unswaddling her during nap time only. You can also do it during the first few hours of nighttime sleep to see how it works with your baby, and then slowly increase the time without the need for swaddling. Simply hold your baby's hands against the chest if she struggles to fall asleep without swaddling. Doing this helps calm down your baby and makes it easier for him or her to fall asleep. You can always switch to sleeping bags designed specially to keep babies in a safe position without tight swaddling. Try these bags and see how they work. If your baby feels comfortable in it, be sure to use it. You can unclip these bags to provide your baby with more freedom with time. Similarly, you can also use swaddling straps to swaddle your older babies. Using these products for a short time may help make it easier for your baby to forget the need of swaddling. While learning when to stop swaddling babies, you should also learn alternative approaches to soothe your baby. Try some soothing techniques, like rocking your baby, singing a lullaby, wearing her in a sling and walking around, and playing soothing music. These techniques will help make your baby less dependent on swaddling. When Does the Startle Reflex Go Away? Can You Have C Section at 37 Weeks? What Causes Yellow Discharge in Pregnancy? Should You Worry? Only One Breast Producing Enough Milk, Why?